An original hand drawn picture. "We're going to have chips and salsa today" - this line will hook the students. Each chip has a regular infinitive -AR verb on it. 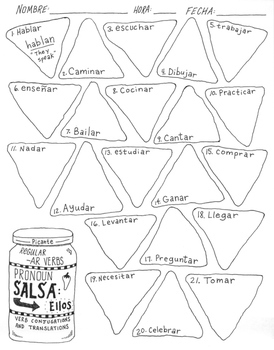 Students must conjugate the verb to match the subject pronoun located on the jar of salsa. After they conjugate the verb they'll need to translate it into English. The -AR verbs include: estudiar, nadar, cantar, ayudar, bailar, ganar, llegar, tomar, necesitar, trabajar, cocinar, etc. There are 21 chips, with one example for the students to see as a model. (All verbs must conjugate to agree with "ellos"). No prep! Print and go!